Thank you so very much for making it possible for those of us residing in small rural communities to enjoy concerts usually only seen in large metropolitan venues. Jeffrey Grossman and Katharine Dain performed in our small town last evening. WOW! In 1921, unhappy with the oppressive political climate in Russia, Piatigorsky escaped into Poland. There are many wonderfully colorful accounts of this border crossing. The stories usually describe him swimming the Zbruch River with cello held high amidst gunfire emanating from both sides. One of these accounts can be read in Piatigorsky’s autobiography, Cellist. The countless variations on this escape can be attributed in part to his incredible story-telling ability. Piatigorsky was well known as a raconteur of unparalleled imagination, wit and charm. He briefly served as principal cellist of the Warsaw Symphony and then made his way to Leipzig to join the class of famed cellist and pedagogue, Julius Klengel. Following his studies in Leipzig, Piatigorsky moved to Berlin to seek employment. While in Berlin he had the opportunity to premier Arnold Schönberg’s “Pierrot Lunaire” with pianist Artur Schnabel, violist/violinist Boris Kroyt, conductor Fritz Stiedry and flautist Paul Bose. This premier led to an audition with conductor Wilhelm Furtwängler and the appointment as principal cellist of the Berlin Philharmonic. Throughout this period of orchestral playing Piatigorsky continued to perform often as soloist, recitalist and chamber musician. He played with violinist Carl Flesch and Artur Schnabel in the first of three famous trios with which he was to be associated. Later he toured with violinist Nathan Milstein and pianist Vladimir Horowitz and finally, in the latter part of his career, with Jascha Heifetz and Artur Rubenstein. After a few years with the Berlin Philharmonic, Piatigorsky embarked on what was to become a legendary solo career. He traveled throughout the world with his cello demonstrating its extraordinary qualities to people everywhere, from the largest cities to the smallest towns. 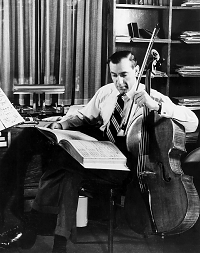 When Piatigorsky first chose the cello in 1910 it was not considered a viable solo instrument. Very few people played the cello with competence or beauty. Cellists were rarely employed as soloists with symphony orchestras and almost never performed recitals. Audiences couldn’t imagine listening to the cello for an entire evening! 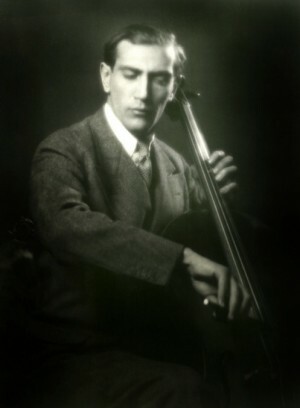 He developed and expanded the technique of the cello making it as facile and expressive as the violin. Piatigorsky also transcribed, arranged, composed and commissioned countless works for the cello thereby increasing its repertoire. His mission was to show the beauty and nobility of the cello’s voice the world over. It is a testament to Gregor Piatigorsky’s career that perhaps the most famous classical instrumentalist today is a cellist, Yo-Yo Ma. In January 1937, “Grisha” (as he was known to his friends) married Jacqueline de Rothschild in Ann Arbor, Michigan. That fall, after returning to France, they had their first child, Jephta. While on tour in the United States in 1939, Piatigorsky happened upon a beautiful property in the Adirondacks being auctioned off by the bank. He put in an extremely low bid and remarkably became the owner of a house in Elizabethtown, New York. A few months later war broke out in Europe. Piatigorsky, his wife and baby daughter, were on the last ship to leave France, just escaping Hitler’s invasion. They took refuge in Elizabethtown where their son, Joram, was born a year later. When Piatigorsky was appointed to the faculty of the Curtis Institute of Music, the family moved to Philadelphia. In 1949, he relocated once again to Los Angeles, first teaching at UCLA and later in 1962 joining violinist Jascha Heifetz on the faculty of the University of Southern California where he spent much of his time teaching and performing chamber music. 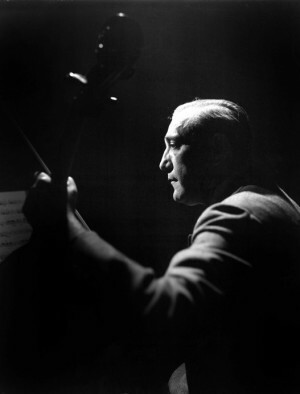 After a unique and remarkable career, Gregor Piatigorsky died at his home in California on August 6, 1976 of lung cancer. His warmth, generosity of spirit and larger than life personality remain in the hearts and minds of all who knew him.